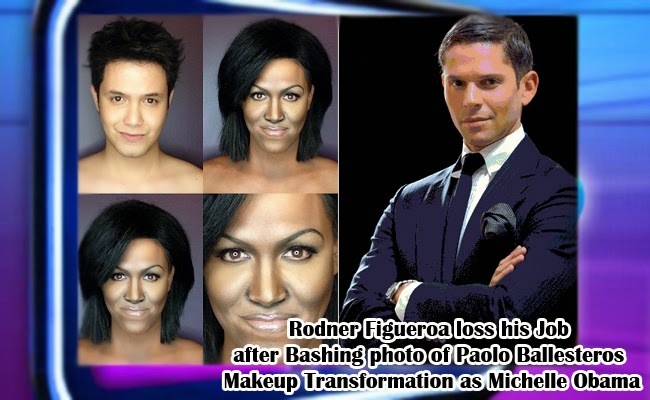 Filipino host and actor Paolo Ballesteros’ transformations usually sparks conversations about his talent, but now it also sparks an international controversy as Rodner Figueroa, host of Emmy award winning talk show ‘El Gordo y la Flaca’, made a remark on his transformation as US First Lady Michelle Obama. In an episode on March 12, 2015 of Univision network’s ‘El Gordo y la Flaca’ which literally means The Scoop and the Skinny, Figueroa and her co-host Raul de Molina where discussing Ballesteros’ various transformations. They had shown the viewers his version of make up transformations of Kim Kardashian, Ariana Grande, Jennifer Lawrence, Jennifer Lopez, Cher, and US First Lady Michelle Obama. Upon the clip showing Ballesteros as Michelle Obama, Figueroa remarked that the US first lady looks like a cast member of Planet of the Apes. Her partner de Molina was quick to cast over the controversial comment and said that maybe Figueroa meant that Michelle Obama is attractive and beautiful. Despite de Molina’s effort to redeem his partner, a radio host was able to pick it up. Javier Ceriano shared the incident in his social media account. Ceriano posted a recorded clip of that part of the episode in Instagram which raised comments and various reactions from the netizens. Because of the sudden slip Figueroa made, Univision network decided to fire her. It was confirmed that the network had let go of Figueroa in a released statement.